Running a company on your own is no easy feat. 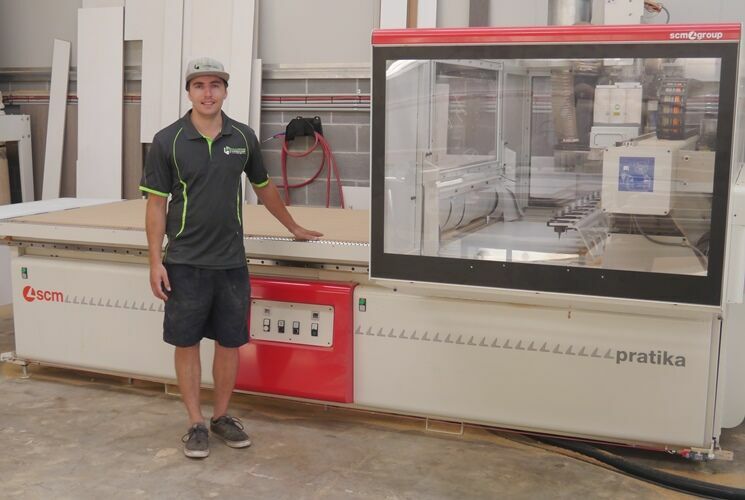 Running a successful company on your own and doubling your turnover in 12 months is an even bigger accomplishment, but one that Brady Harris, of Harris Kitchens and Joinery was able to achieve after his first year of operation. Perfecting his craft throughout his career with a number of well-known commercial kitchen companies, Brady has quickly become known around the Hawkesbury Region of Sydney for his attention to detail and high level of craftsmanship. The majority of Harris Kitchens and Joinery’s projects are top-end, custom built private homes where the average build cost is well over a million dollars. Brady’s rise to this level of production was no accident. “Starting out on my own, I had to make the choice between employing staff or tooling up my factory with the right machines for the job,"says Brady. With cost, reliability and level of experience becoming major concerns during the hiring process, Brady made the conscious decision to choose machine power over man power and invested in an SCM CNC Nesting Machine from SCM Australia. A versatile machine perfect for a range of joinery applications, the SCM CNC Nesting Machine is able to size, drill and rout nested panels. “For each new home, I typically design, manufacture and install the kitchen, walk-in pantry, laundry, study and barbecue area. I needed a machine that would to be able to cope with different applications and outputs to be able to deliver the different designs I need for each element”. The design process with a new client usually starts with a 3D floorplan; however the next step in translating the design to a machining output can often be time consuming. “Moreover, the Scm nesting working center has perfectly been integrated with the Xcab Software” says Brady. “I used to meticulously plan my projects by hand, but with Xcab & the CNC Machine I just enter in my cabinets and export the design – it has worked out to an average saving of 25 hours for each job”.